During my long voyage to and from work every day I get tired to flipping between radio stations. Yeah sure I could pay the money for one of those space radio things but that would just be one more bill to pay. I had the idea to buy an Stereo Audio to FM converter so that I could listen to audio from my MP3 player or smartphone on my cars FM radio. While looking through the pages of SparkFun electronics I stumbled upon the NS73M breakout board. 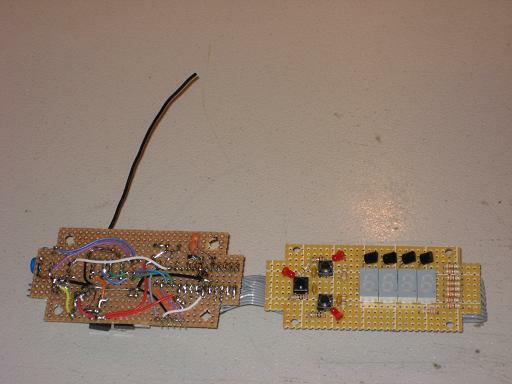 So I thought, "Why don't I just build an FM transmitter myself?" Yeah sure buying one would probably be cheaper but you don't learn anything from just buying something. 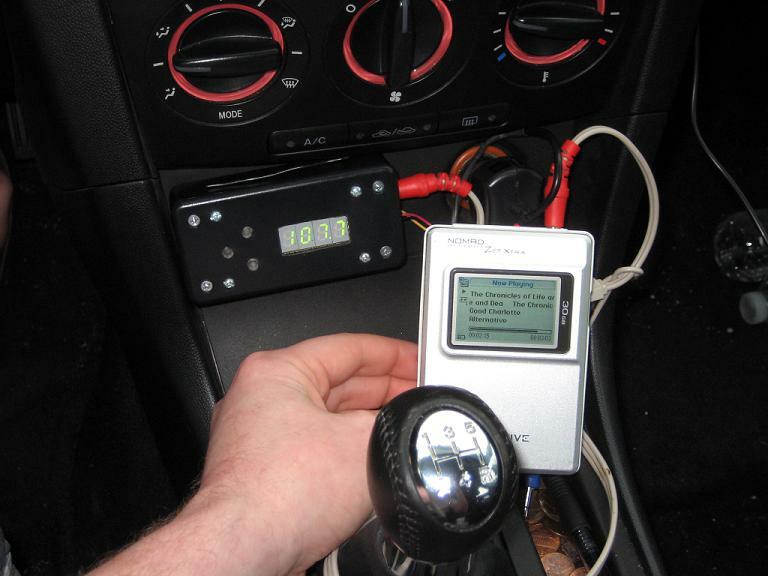 The display of the FM transmitter is a set of four seven segment LEDs. The LEDs are driven using a technique called charlieplexing. Charliplexing allows for fewer pins to drive a large number of LEDs. 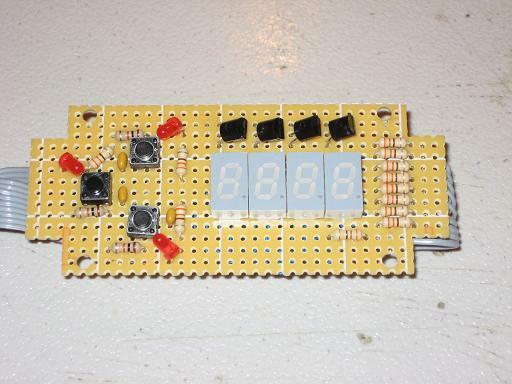 The four seven segment displays are driven using only 9 pins of the microcontroller. There are three buttons that provide the user interface. The buttons allow for the setting of the transmission frequency. The display is updated at ~1kHz which provides a very stable image. The transmitter user buttons are general purpose tactile switches. Cut off push pins are used to extend the buttons through the housing. Clear push pins were used to allow for the LEDs to illuminated the buttons during operation. 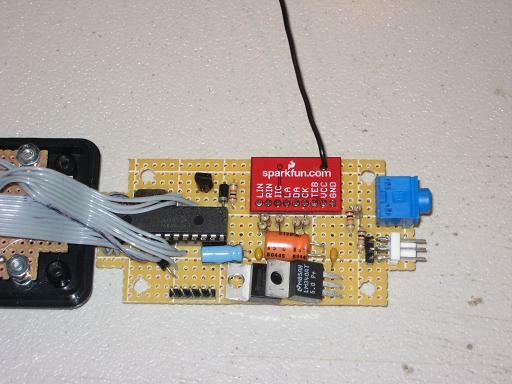 The heart of the FM transmitter is the NS73M breakout board from SparkFun Electronics. 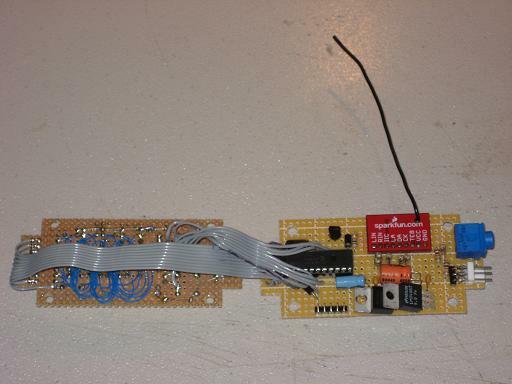 The processing is provided by a PIC16F876A running at 20MHz. The micro scans the buttons for inputs, updates/refreshes the display and sets up the NS73M over I2C. 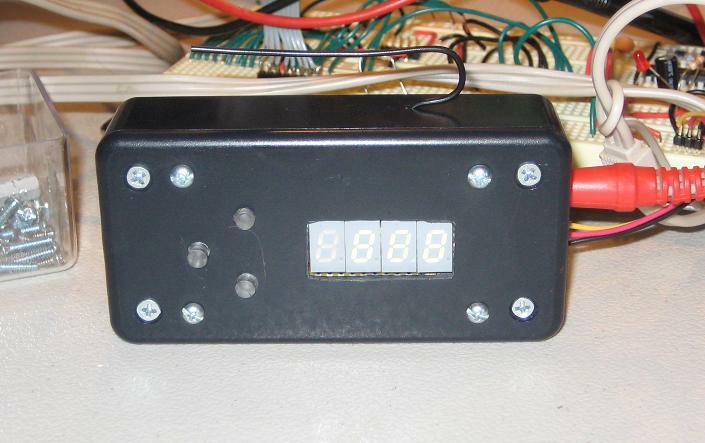 The input power is regulated to 5 volts for the micro and display. The 5 volts is regulated to 3.3V for the NS37M. The antenna for the NS73M is an ~6 inch peice of wire. I have found that for short distances (<10 feet) the antenna length is not really critical. Between the display and main board is a tangle of wires that provides the stimulus for the display and carry the button inputs to the micro. FM Transmitter: Whats in the Box? The whole setup fits inside a project box from Radio Shack. The project box measures 4"x2"x1". Two holes were drilled into one end of the box to allow for the 1/8" stereo jack and power plug to be attached. Screws and hot glue were used to space the display board the proper distance from the front panel to allow for proper operation of the tactile switches. The puch pins work pretty well as buttons and the tactile swithes provide a nice feedback when pressed. The project box containing the FM transmitter was attached to the dashboard using industrial velcro. Power is pulled from the auxilliary 12V plug (formally known as cigarette lighter) using an old car phone charger. 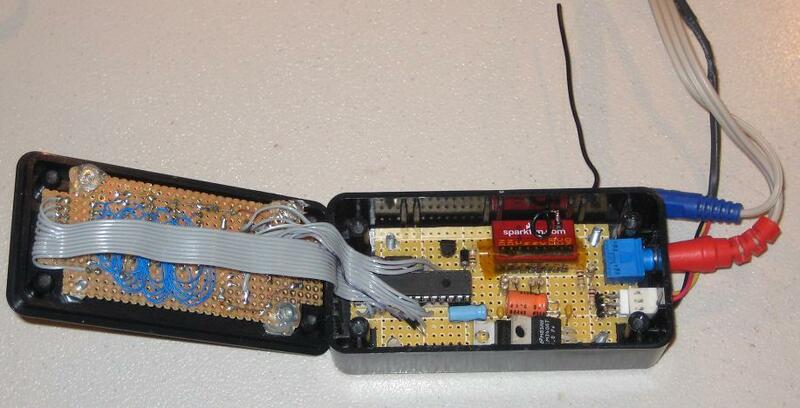 I removed all the internals from the car charger and rewired it to let the 12V from the car feed the FM transmitter. Here is the FM Trasmitter installed and working great. The reception from the NS73M module it pretty good. There is sometimes a little static in the background if the module is tuned close to a major local FM station.